We recently had our first good look at a male leopard that seems to have been spending time in the northern reaches of Londolozi. We were quite lucky to locate him and initially had no idea that he was even in the area. While Rich Siwele and I were driving one of the roads in this area, Rich spotted an impala carcass hoisted in a tree. A sure sign that there is a leopard in the area, we looked around and soon noticed the Nyeleti 3:3 young female lying on the ground not far from the tree. Funnily enough, this was the first time I had seen the Nyeleti young female, so, eager to get a closer look, I set about looking for a place to cross a deceivingly tricky drainage line. Eventually Rich and I found a place that we agreed looked crossable. As my front wheels went into the riverbed, I started sinking and was past the point of no return. Eager not to get the dreaded pink ammunition pouch (an ‘award’ for the last ranger who gets stuck and has to be towed), Rich and I set about packing branches, rocks and any other debris we could find, under the wheels. The only problem was that the Nyeleti young female was now lying a mere 25 odd metres from us! After feeding for a short while, the Gowrie male lay on top of the impala carcass, just to ensure that the Nyeleti young female didn’t scavenge the remains. It was then that I discovered what would turn out to be the Gowrie male. All the while, I’d been closely watching the Nyeleti young female as Richard assessed the situation and gathered the necessary tools. She seemed quite relaxed and, apart from the occasional cursory glance, she didn’t pay us much attention at all. I was therefore quite surprised to hear a rumbling/growling coming from her direction. 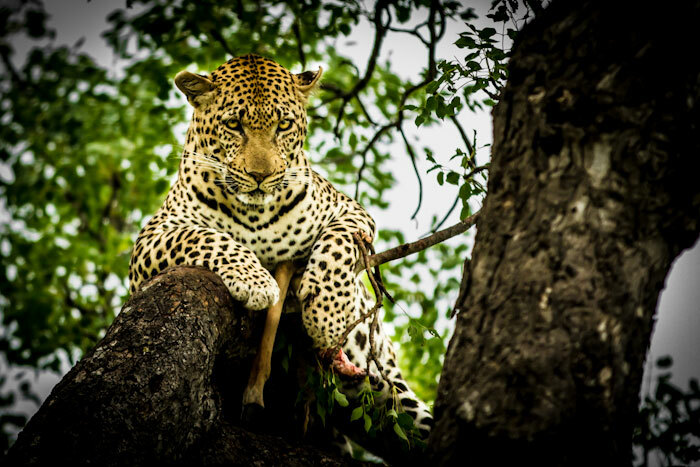 It clearly wasn’t the female leopard growling and with the Marthly male being on a kill on the other side of the Manyeleti River, it was unlikely to be a male who had robbed her of her kill. Just then, I heard a rustle in the bushes and saw a large male dragging his kill away from the commotion we were causing. Desperate to get a glimpse of this unknown male, Rich and I escalated our efforts and soon managed to get ourselves unstuck and, after following the drag mark created by the male dragging the remains of the impala through the long grass, we found him lying in a thicket of silver cluster leaf trees. His striking orange eyes are quite distinctive. He wasn’t nearly as relaxed as many of the other leopards that we are lucky enough to view. He flattened his ears and gave us the occasional snarl while protecting his prized impala. I wasn’t sure as to whether this was due him being annoyed by our efforts to get unstuck while he was guarding his kill, or whether it was just his temperament. It turns out that, based on sightings to the north of Londolozi, this is quite normal for him and seems to be part of his personality. Based on his reaction, we decided to leave him and return in the afternoon to see if his mood had improved. When we returned, he had hoisted the impala into a marula tree and, after feeding for a while, he lay on top of the remains, just to make sure that the Nyeleti young female had no chance of scavenging any of the remains! Upon closer inspection, I noticed that he has a 2:1 spot pattern (2 on the right cheek and 1 on the left) and a scar next to the single spot on his left cheek. He also has very striking orange eyes, which are quite distinctive. Even though the impala was safely hoisted in the marula tree, he stood up to check on a hyena who had moved into the vicinity, having likely detected the scent of the carcass. 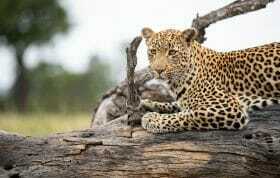 The Nyeleti young female was also still lying at the base of the tree hoping to get a few scraps. I managed to find out that he is seen on both MalaMala, where he is known as the Gowrie male, and in the northern Sabi Sand, where he is called Lamula. 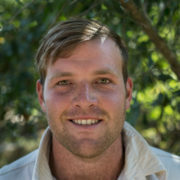 in the Sabi Sand Wildtuin during July 2011. He is said to have initially been quite nervous, but he has since relaxed. His origins are uncertain, but the fact that he was nervous suggests that he has perhaps moved in from the Kruger National Park, or an area where he has not been viewed very frequently. 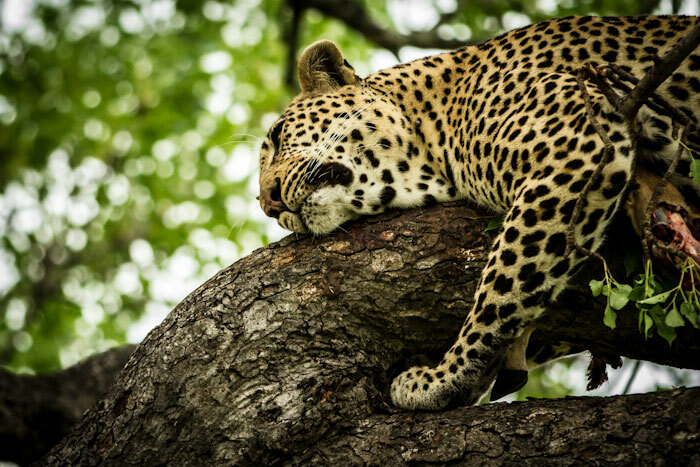 After initially seeming quite nervous and not very tolerant of the game viewers, the Gowrie male relaxed a lot and eventually went to sleep in a ‘typical’ leopard pose on the branch of a marula tree. 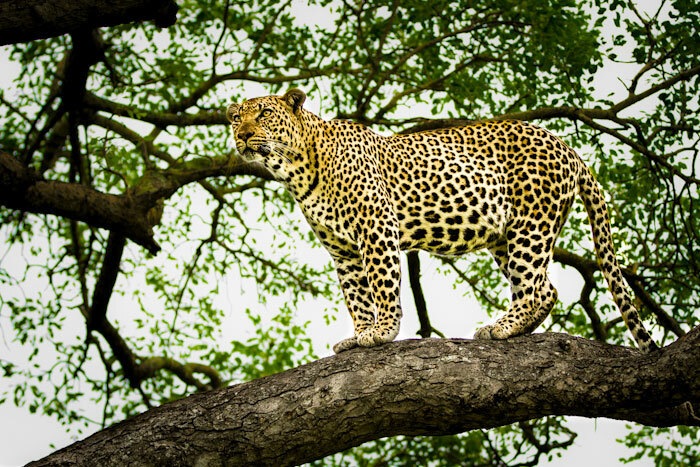 He has been seen crossing south onto Londolozi all the way along the northern break of Marthly, but most of the time it seems that he is in the northeastern sector of Marthly. For some time now, I’ve noticed that the Marthly male has been moving further and further south, into what used to be the Camp Pan male’s territory. After seeing the Gowrie male on northern Londolozi and, learning that he has been frequenting the area quite regularly, I wonder if this shift in the territory of the Marthly male is due to pressure from the Gowrie male in the north? I’m sure that in time we will see if the trend continues and hopefully we’ll have more regular sightings of the Gowrie male. on Who is the Gowrie Male? What has happened to Camp Pan male? Is he still around? He’s a beatiful boy… what happened to camp pan male? Thelma, please see my response to your comment above. He is a very handsome fellow! Hope he sticks around a while and broadens the gene pool! Seems as if he was looking to take over Mufufunyane’s (RIP) territory but Tingana beat him to it, so he moved a bit east hoping to take over Yambilu Jordaan’s (RIP) territory and found Mvula there, so he’s now moving south. James, how did you determine the age of this leopard? Do you look at the colour of his nose-whether it is pink, black or inbetween? Nic, we haven’t seen him much at all, so this was based on information from the properties that have seen him more regularly, to our north and east. The colour of the nose, however, is one feature that can be used. One would also look at the position of the ears (wider spacing is normally an indicator of an older leopard), the size of the head, scars from territorial battles etc. He is stunning, and your photo of him face-on is fabulous. Ditto to Geri’s comment!! So handsome–hope he hangs around until March. Wow what a magnificent boy! Hope he stays around, would love to learn more about him and hope to see him next winter. how does he compare in size to Tukwaan and Camp Pan males? He looks to be substantial. Kiki, the Gowrie male looked very large when I saw him, but he had just eaten the better part of an impala! I think that he is a similar size to the Marthly male. Probably slightly smaller than the Camp Pan male and larger than the Tugwaan male, but that’s just based on the impression I got based on one sighting. Thanks James, just lovely to see him! Thanks for the info about his age James, its really helpful! 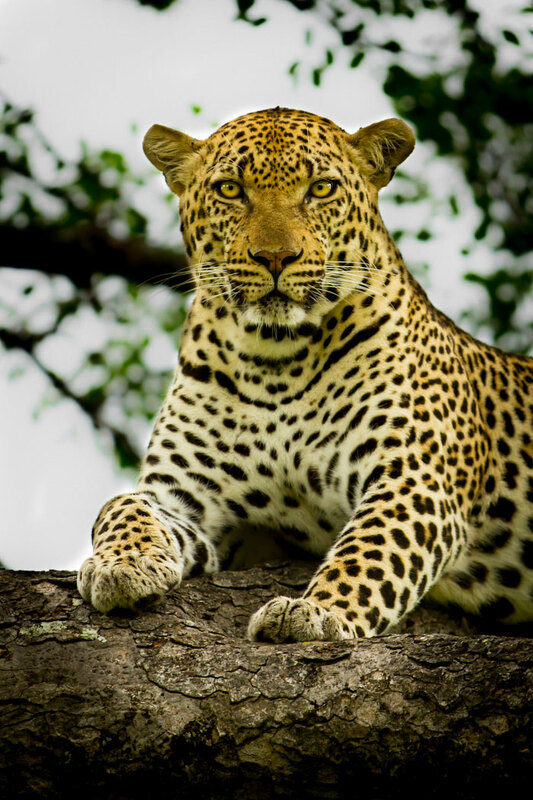 I think he is know elsewhere as Lamula.. he is a very striking leopard! Long may he reign!